Firstly you need to be aware of what your neutral behaviours are and what they look like for you, you gotta have a handle on your own normal. Then when work stress symptoms and behaviours start showing up in your work day, you’re gonna feel a bit off and want to pull yourself up. Give yourself a half hour to do anything you want – every day. Go for a walk in nature – regularly. Put your rad music on and – cook, dance with the kids and with each other. For me, the number one stress relief for me, is simply playing with my son, it zens me out. I love my son, I adore my son, I would eat his feet if they were on the menu. He’s just an incredible individual who lights up my life. He has the ability to make the rest of the world seem insignificant and not matter, especially when there’s high stress around me. Meditation has the ability to melt stress away so effortlessly and easily, it’s not funny. So, then number three for me, is calisthenics. I love calisthenics training and bodyweight training. I love the flexibility of the body, the strength of the body. The coolest thing about calisthenics is really an effective and efficient way of training, you’re never training any part of the body in isolation. 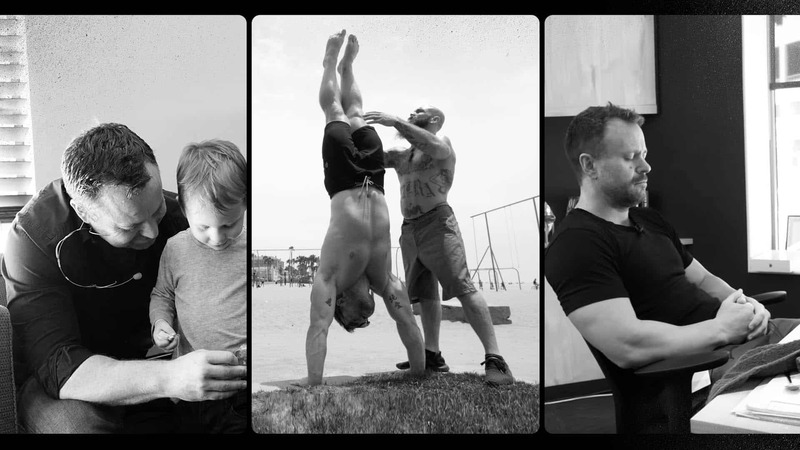 Nine out of ten times you’re training the body as a complete unit, or at least a large part of it together. So it’s a great way to burn a lot of energy in a short period of time that will help recovery from stressful events. Yeah, for me, my top three defrag stress relievers are; playing with my son, meditation and calisthenics. This makes life so much easier.